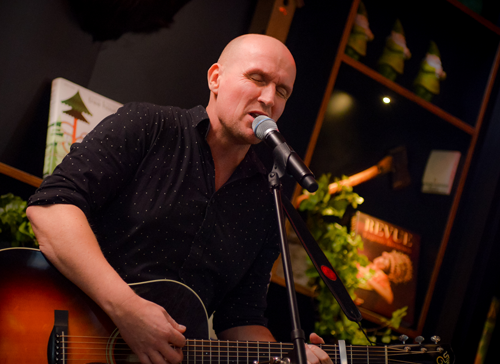 Ruud Houweling is a Dutch songwriter, composer, lyricist, producer, vocalist and guitarist. Houweling studied visual communicatie at the Willem de Kooning Academie in Rotterdam. with his band Cloudmachine, Houweling released since 2003 four albums of alternatieve pop. ''Back On Land'' (2009) was partially recorded in California by the American Audio Engineer Oz Fritz (Tom Waits, Bill Laswell, Primus.) for the single ''Safe Haven''. Harrie Geelen created an animation-video for the album that was later taken into the collection of the Eye Film Institute. The album ''A Gentle Sting'' (2013) was produced by Tristan Longworth. It won the public award of the American 13th Independent Music Awards (2014), in the category ''Best Indie/Alternative Rock album''. Houweling written amongst other things songs for '''Kinderen voor Kinderen'' (2004) and for ''De Sprookjes Luisterboeken 1 t/m 6 van de Efteling'' (2004-2006), where he also sings. In 2005 Houweling made in 2005 music for the Villa Achterwerk-series ''Coupe Troep'' and the Cinekid-film ''Iedereen communiceert maar begrijpen we elkaar ook?'' that was screened at the IDFA in 2006. He wrote the song ''My Little Phoenix'' with Michiel van Zundert, that was recorded by Tarja Turunen for her album ''My Winter Storm''. the album reached the status of double-platinum in Russia, Platinum in Finland, and gold in Germany and Czech Republic, and sold over half a million copies. In 2009 Houweling composed music for the documentary ''The New York Connection'' (Directed by Roel van Dalen) about 400-years of New York (AVRO / IDTV-DOCS). In 2011 Houweling wrote with Ricky Koole the song ''Ik Ben Stil'' for her album ''Wind Om Het Huis''. In 2012 he composed and produced music for the NTR-documentary ''De Gouden Eeuw'' that was broadcasted between December 2012 and March 2013. He also composed music for the NTR Academie, that was broadcasted on Nederland 2 between juny 2013 and april 2014. for Ricky Koole he also wrote the song ''Dead Again'', and ''Don't Wait Up'' together with her, for her album ''No Use Crying'' that was released in January 2014.